For those who have received the free gift of eternal life through Christ Jesus, learning to cast our care upon God can be frightening. Our natural instinct is to try to fix our problems on our own, or do it with an “assist” from God. Satan preys on these tendencies. But we really only cast our care upon God when we realize we are helpless. This is when we find ourselves truly humble. 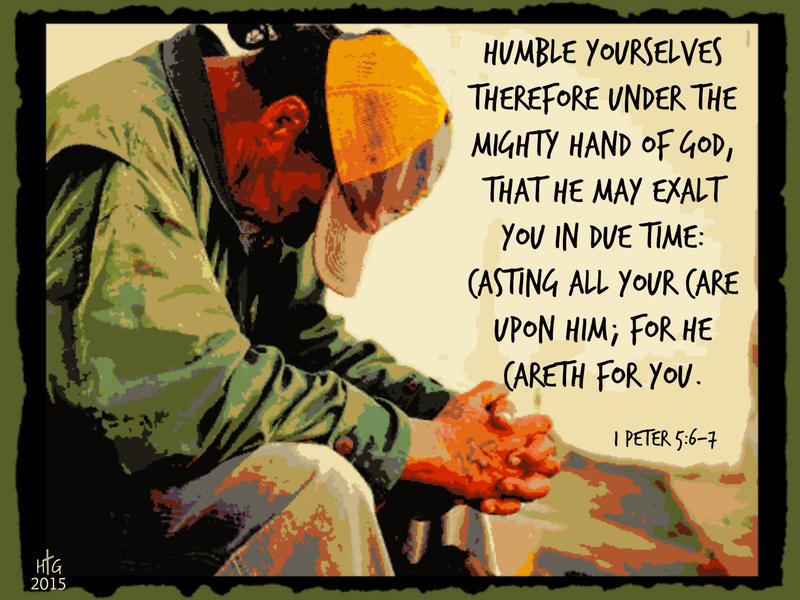 Sometimes, we wait until our own abilities are exhausted and then cast our care upon Him. Our fleshly rendition of this passage is to keep an eye out for trouble, and to make sure to fight it off. But, we are no match for the devil. He doesn’t fight fair. He gets in our heads. He influences our thoughts. The full armor of God is not His trappings. It is God Himself. Ephesians 6:16: Above all, taking the shield of faith, wherewith ye shall be able to quench all the fiery darts of the wicked. The shield of faith – the object of our faith – is God Himself. Psalm 28:7: The LORD is my strength and my shield; my heart trusted in him, and I am helped: therefore my heart greatly rejoiceth; and with my song will I praise him. The Lord is trying to teach us to cast our care on Him. He doesn’t punish us when we don’t – he allows us to feel the pain. But, he blesses us when we do. I find Psalm 23 to be one of the most comforting passages of scripture – the calmness associated with the Good Shepherd. He will come get us if we are in the ditch and call out to Him. He will defend us against the enemy. He is there for us always. Cast all of your care upon Him. This entry was posted in Assurance, Love of God, Peace. Bookmark the permalink. Josh, hope to see you back and that you might get some comfort from His Word. Just like Jason65, LS did a number on me as well. It seems that this is a place of healing for those that have been damaged by the false gospel of works for or evidence of Salvation. Josh, LS did a number on me, too. Josh, we are glad you are here! I stumbled upon this at a time while I was anxious and worried about so many things that I was a wreck. Thank you. Phil, I remember that about ‘Great is thy Faithfulness’. Johninnc, this was a good reminder for the great necessity of our armor, and reading about what happens when we do not cast our cares on Him, so true. The burdens remains heavy. Somehow our sin nature wants to take our cares back. Or sometimes we want to hide our head in the sand rather than be a part of the solution with Him guiding and directing us. I hope some I know might read this and pray about it, really take it in. It is so much easier going through hard times with Him if we would just get that through our thick heads sometimes rather than wallowing in our misery. Excellent post, John, thank you. holly, I never read Lamentations much, and the wonderful hymn, “Great is Thy Faithfulness” come from this passage. The Lord has much here to say and comfort the believer. We can and should cast all our cares upon him. yet will he have compassion according to the multitude of his mercies. John, we had a Bible study last week, in which it was kind of free and unplanned. We were to be on John 12, but because of some health issues and things I needed to deal with, I was unable to teach. But the Word was just wonderful, very similar to this. One started with Psalm 139 and I believe most of us had silent tears from the emotion of reflecting on God’s love towards us. We moved on to Psalm 63 with is a special one to me. Then we went to Psalm 73:21-28, then Psalm 56:8-13 (He keeps our tears, and numbers our wandering — God is for me -He has delivered our soul from death, and kept our feet from falling). Then 147:3-7, we spoke about how He heals the brokenhearted and binds their wounds, and how He numbers the stars and calls them by name…Ps 94:17-19, Jer 31:25; Lam 3:19-33. I’ll share a few. We just kept going… How great the Lord is to comfort us, revive us, strengthen us, by His Word. Thank you John, here are some others that come to mind. We need His Word.